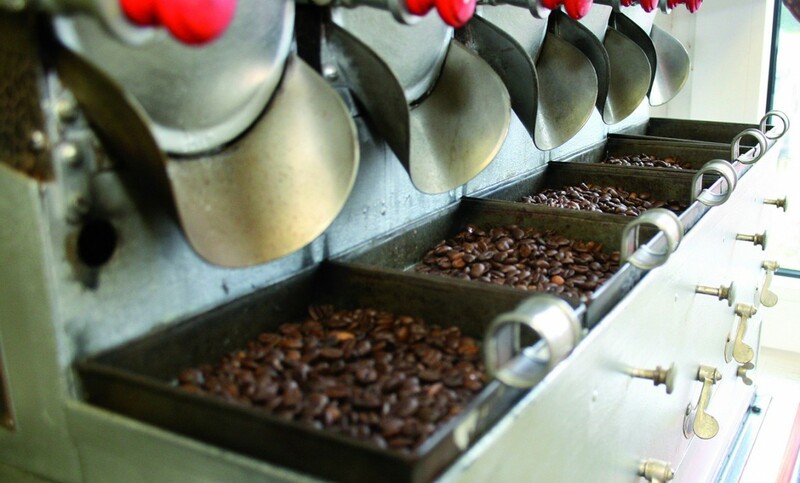 Our modern batch roaster enables us to roast our coffee beans with great precision. Coffee is generally subject to natural fluctuations based on factors such as its region of origin, how it is processed after harvesting, bean size and the beans’ moisture content. We therefore define an individual roasting profile for each coffee in order to bring body, aroma and acids into perfect harmony and to achieve the optimum taste. To enable us to accommodate the different nature of the beans, we work with relatively small volumes (batches), as smaller batches are more controllable than larger ones. In general, we roast our coffee slowly and without using excessive heat – inclusive of pre-heating, for up to 16 minutes at a maximum of 230 degrees Celsius. The long roasting period removes any aggressive acids. That makes the coffee mild and easy on the body. We also ensure that the multifaceted aromas are not destroyed by an excessively long roasting period, as otherwise the coffee would taste burnt and bitter. And there is especially one thing needed to get it exactly right: experience. There is a reason why it takes at least seven years to become fully trained as a master roaster. It is therefore very helpful that we are no beginners at roasting coffee beans ourselves: our roasting operation has been in existence since 1933 and ranks as Germany’s oldest organic roasting business. What’s more, our master roasters responsible for its operation have already been with us for over 20 years.